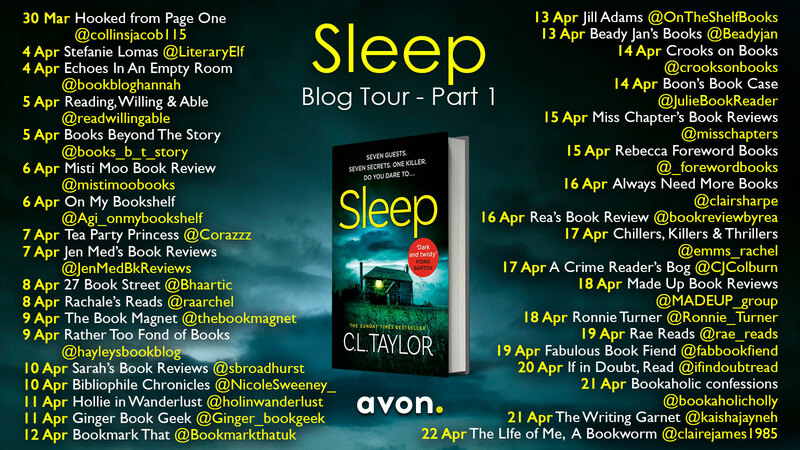 I’ve read a few novels by CL Taylor so was very pleased to be invited onto the blog tour for her latest book, Sleep. Sleep tells the tale of Anna who was involved in a crash that she struggles to come to terms with. She blames herself for the tragic outcome of it and is suffering from severe insomnia and paranoia. Believing that she is being targeted by a stalker, she moves to a remote island in Scotland to work at a guest house. With only 36 residents on the island she believes that it is a safe place. However when the first guests arrive, a storm follows quickly after them. It is so severe that it traps Anna and the guests on the Island with no internet or phone signal. As things go from bad to worse Anna’s paranoia escalates and it soon becomes clear that all the guests are hiding secrets, and she believes someone is out to get her. Sleep was an interesting novel. It reminded me a bit of a ‘locked room’ Agatha Christie style crime, but with an entire island and peripheral characters involved. The main character of Anna was a sad and slightly annoying person in my opinion. Clearly the guilt she felt was overwhelming her, but it did feel a little as though her self pity was the only element of her character involved. However this flaw in her added to the tension in the novel which was palpable. The fact that you didn’t know if it was just her paranoia or if there was really someone out to get her made this a real page turner. The story itself was good and it has some really creepy elements to it. I like a claustrophobic feel to a crime story and this has that in waves. The plot zips along with speed, and each time you felt like you were closing in on the truth more red herrings were thrown in. CL Taylor’s novels are always entertaining and will keep you gripped throughout and Sleep is no exception. Thanks to Avon books for my copy. You can purchase Sleep here. I was delighted to be invited onto the blog tour for author Bev Thomas’s debut novel A Good Enough Mother. A Good Enough Mother follows Ruth Hartland, the Director of a trauma therapy unit in London. She is well respected psychotherapist with a fantastic career, yet her personal life is in bits. Tom her seventeen year old son has been missing for two years and has had no contact with anyone, her marriage has crumbled, and she has a difficult relationship with her daughter Tom’s twin sister. When a disturbed patient is referred she is shocked by the fact that Dan looks exactly like her missing son, and things soon start to spiral out of control as her professional boundaries start to blur. This is a story of families told from the perspective of a mother dealing with both grief and guilt about her own part in the breakdown of the family. It was a gripping tale that I found fascinating. The author was a trained clinical psychologist and that comes across in the writing. As well as learning about Dan we also find out about other patients, they are background characters but give us a great insight into how Ruth usually works to contrast with her relationship with Dan. This isn’t necessarily an easy read as it is emotional and sad. The quality of the writing draws you in as it weaves through to its inevitable car crash which I found quite shocking. The character of Ruth is intriguing. For someone who is supposedly at the top of the tree in her career she certainly makes some annoying mistakes, yet that is partly a consequence of her emotional state. A Good Enough Mother is part mystery and part emotional drama both of which are utterly compelling. I would highly recommend this debut novel. I am a big fan of writer Leigh Russell and so I jumped at the chance to read her latest novel Rogue Killer. In Rogue Killer we again meet up with Detective Geraldine Steel. She is still living in York and starts to investigate when a man is killed, and suspicion falls on a gang of opportune muggers. Geraldine Steel is the only one who thinks this is work of a murderer. When two more victims are found, the muggers are tracked down. However, it soon becomes clear that it isn’t them, and that a killer is on the loose. One who seemingly believes that he is invincible despite there being DNA found. Yet he hadn’t banked on the tenacity of Geraldine. Rogue Killer is an interesting story that kept me hooked throughout. I felt the story was very clever, and especially enjoyed the setting in York. This is one of those stories that walks you through the streets of the city it is set in and as a York dweller myself you can imagine the routes taken. Although the crimes are pretty gruesome, this isn’t a graphic novel with most of the violence happening off the page which I think can often make things even more chilling. There were also chapters from the killers point of view, which personally I always really enjoy, although I suppose enjoy isn’t really the right word they were rather disturbing. Although this is the latest in a long series it can still be read as a standalone. There were plenty of background references given, and you can soon work out the relationships between Geraldine and her two very different sisters and the tension between Geraldine and her now superior officer Ian. One of the things I really like about Leigh Russell’s books is the attention given to somewhat peripheral characters, in this case the gang of muggers. The interaction between the three was interesting and showed a sense of vulnerability alongside the arrogance and unpleasantness that makes you think they deserve whatever they get. Of course the standout character is Geraldine, and despite her being a little annoying at times when she can be a bit slow on the uptake, she is a character that on the whole I like. I very much enjoyed this story and would recommend Leigh Russell’s series to anyone who likes a gritty thriller. To find out more about Rogue Killer pop over to the other spots on the Blog Tour tomorrow is the turn of Short Book and Scribes. The story starts with the body of Kerry being found in her parent’s swimming pool. Her parent’s had been away and she had thrown a party but despite the house being packed with people no one saw anything. Her boyfriend is the main suspect to start with, as they were known to have a pretty argumentative relationship. However there are other suspects including the boy next door who was upset that he didn’t get invited to the party and the mysterious big guy that was spotted by the neighbour. Kerry’s sister has just returned after travelling to work as a guidance counsellor at her sister’s old school and as well as dealing with her own grief she has to help her sister’s friends deal with theirs. This was a great quick read that I thoroughly enjoyed. I must confess it wasn’t the most difficult mystery to solve, it was pretty obvious early on what the outcome might be. However that at no point spoils the story. The key to Mary Higgins Clark longevity is her characterisation and writing style. Short chapters make it an easy read that keeps you doing the classic just one more chapter then I’ll put the book down until early morning. The characters are all well rounded and there is a good mix of likeable and annoying ones. Of course as well as the mystery there is also a romance, and that just adds to the intrigue in the book. As with all her novels this isn’t gruesome graphic novel, it is a story of a murder and of why it happened. I would recommend this if you want an easy fast yet satisfying read. I have always been a bit wary of fitbit’s, so many people seem to wear them and in my head I’ve always imagined that somewhere there are aliens getting ready to take over the planet. They’ll just flick a switch and everyone with a fitbit will be turned into a killing robot. Therefore when I was invited onto the promotional blog tour for Black Matter I was happy to help! Black matter is the debut novel by author GD Parker. It is book one of a three-part series that explores the depths of the unfolding high-tech world we now live in, making it a dangerous place. The future is now… it’s terrifying!!! Humanity locks jaws with the ever-increasing human desires towards highly advanced technological innovations making the world a dangerous place. Unanticipated horrific consequences unfold for Tommy McGregor when he partakes in a new high-tech innovation to enhance his health and wellbeing. He thought it would make him healthier, better looking and live forever…DI Valentina is out of her comfort zone when she’s tasked to track down a killer, unknown to her, hidden behind a digital mask. The future has already fallen upon humanity as she soon discovers, nothing is as it seems anymore as society embarks in technology that’s already here. A terrifying mystery, it feeds your imaginative mind’s eye – a fast-paced “whoisit” thrilling crime, novel that will leave you guessing until the end, (or will it?) As it leaves the hairs on your arms stand on end as you uncontrollably turn each page in this 3 part series. Gareth was born in the UK in 1981. A family man he has spent much of his working life in South Wales working in a professional capacity. One day he made the decision write about an idea he dreamt about. Still working full time for a large organisation, he enjoys reading all manner of books, and spending time with his family. If you would like to read this novel, set not too far in the future then it is out now. I bet it makes you think twice about keeping hold of your activity tracker though!